A deep and wonderfully rich autumn sauté. Quick, simple and unusual – catch the season’s oysters while they’re at their best. I like this recipe’s balance of ingredients from the earth, land and sea, and with them all the tones of the woodland in October. Bring a pan of fresh salted water to the boil. 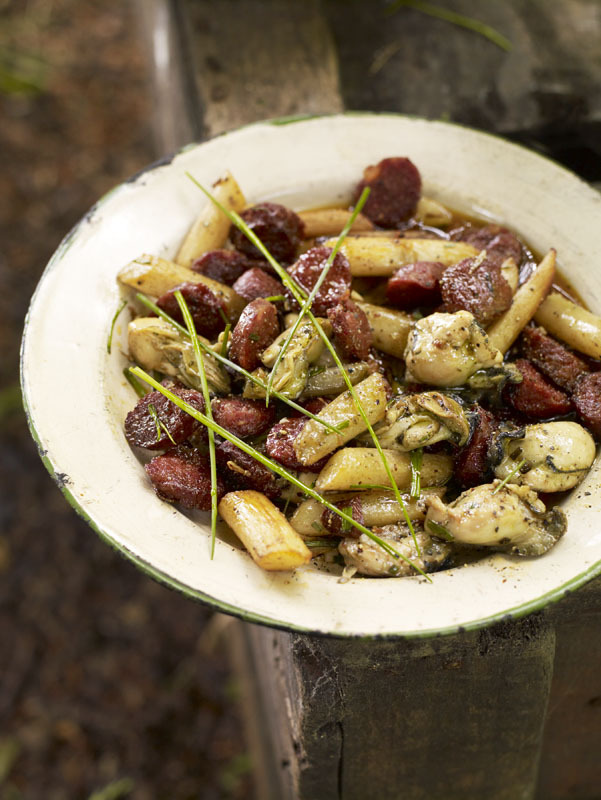 Cook the salsify for 8-10 mins or until just tender. Drain and allow to cool. Cut the salsify into 5-8 cm pieces. in. Once in, move the blade across the top of the shell. This will release the oyster and allow you to remove and discard the top shell. Slide the knife blade underneath the oyster and cut the adductor muscle that attaches it to the bottom shell. The oyster will now be free, alive and ready to eat along with the delicious liquor that should remain in the shell. Place a large frying pan over a medium/ high heat. Add the olive oil followed by the salsify. Fry, tossing occasionally until beginning to colour, for 6-8 mins. Add the chorizo and continue to cook, turning regularly for a further 3-4 mins. The sausage should just begin to crisp and give up its wonderful paprika-spiked oils. 4. Now add the oysters and their juices, the garlic and chives. Season lightly with salt and pepper and cook for 1-2 mins. Serve the sauté straight away with good bread, red wine and coffee to finish.